Brazil Services PMI rose to 44.8 in August from July's 39.1. This marks seventh consecutive month of Services reading below 50.0. July fire was horrific and cam on top of abysmal 39.9 reading in June. August reading is still below 50, but is now the second highest in 7 months. In 12 months from August 2014, the index posted above 50 reading in only two months. This confirms deep-running recessionary dynamic in Brazil's economy. Russia Services PMI came in at 49.1, below 50.0 and down on 51.6 in July. Details covered here. As noted, this is a disappointing reading signalling weak contraction in the Services side of the Russian economy, compounding sharper contraction in Manufacturing. China Services PMI posted 51.5 in August, down from 53.8 in July. This index has never reached below 50.0 in its history, so 51.5 is a weak reading overall. In fact, this is the slowest pace of expansion signalled by the Services sector since July 2014. Taken together with rather sharp ongoing contraction in Manufacturing, the Services PMI for China suggests that current rate of economic growth in the country is well below the target of 7% annual rate of growth targeted by the Chinese Government. Most likely, stripping out financials (supported by the Government aggressive intervention in the stock markets in recent months), China's Services PMI would be in much worse shape. India Services PMI came in at 51.8 - signalling acceleration in growth from 50.8 in July. This marks second consecutive month of above 50.0 readings for this index. For China: "The Caixin China General Services Business Activity Index …signalled the slowest increase in activity in the current 13-month sequence of expansion. Total new order growth at service sector companies also weakened in August, with the latest increase in new business the slowest seen in just over a year. According to anecdotal evidence, relatively subdued market conditions had dampened client demand in the latest survey period." For India: "The seasonally adjusted Nikkei Services Business Activity Index [pointed] to a faster, although modest, expansion in output. Activity growth was recorded in three of the six monitored categories, namely, Hotels & Restaurants, Post & Telecommunication and ‘Other Services’. Leading services activity to increase was a further rise in incoming new work. According to panellists, higher demand coupled with capacity improvements and increased marketing all had contributed to the latest expansion in new business. Despite quickening since July, the rate of growth was moderate. While manufacturing new work rose at a weaker pace than in July, growth nevertheless outpaced that seen at their services counterparts." 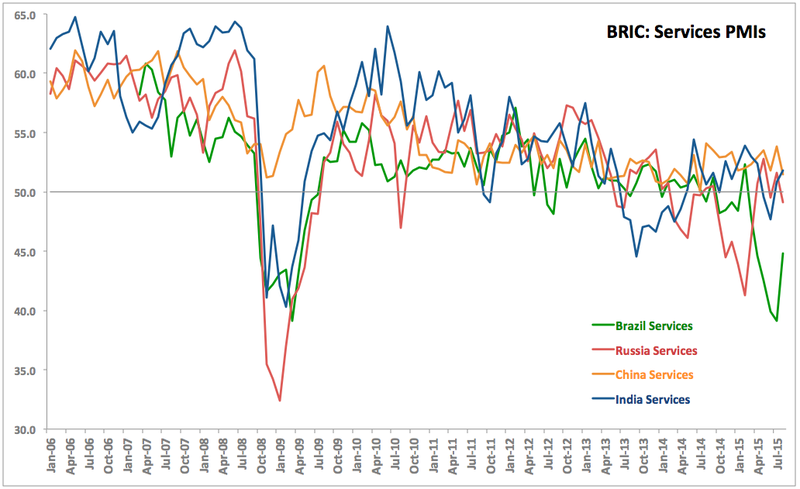 CONCLUSION: BRIC economies are suffering from the twin effects on internal structural weaknesses (domestic markets and policies) and from lack of external demand growth. These leading emerging market economies are now solidly in a recessionary dynamic (Brazil and Russia), and near hard landing territory (China). 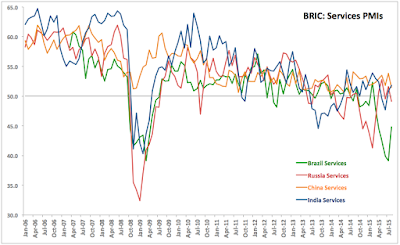 India continues to break trend with the rest of BRICs, although this remains to be seen how long its economy can sustain this decoupling.